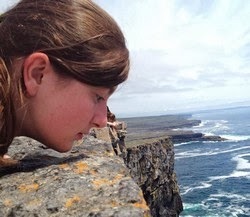 Rebecca Mast: Hello From Ireland! Hello, everybody! Sorry about the radio silence over the last few days... I'm in Ireland now! I'll be studying literature and film at NUI Galway for the next month. I had to write a very stressful paper over the last few days, but I finally got it done! I hope to get back to posting regularly now. I woke up unreasonably early on Sunday morning. My host mom drove me to the train station, and after a very sad goodbye, I jumped on a bus and headed to Paris with the rest of my group. At the airport, we all parted ways and I headed off alone. After four hours by myself at the airport, I got on a plane and soon landed in Dublin. In Dublin, I called my hotel and had them send a shuttle for me. I spent a very lovely night at the hotel and then headed back to the airport the next morning. I bought a bus ticket and rode across the country on a very comfy coach, arriving at the bus station in Galway. Then I got a cab, which dropped me off in front of my apartment. Ladies and gentlemen... I did it. You have noooo idea how much I'd been stressing over that stretch of my trip. You see, that part was all up to me. There was no professor or trip director telling me where and when to go and how to do things. I had to figure stuff out for myself. Add into that the facts that I had never been on a plane or bus by myself before, I had never taken a taxi before, I had never been alone in a foreign country before, and I'm afraid of talking to people (especially on the phone), and that's just a recipe for disaster. But I did it!!! I can be a grownup when I have to! Yaaaaaaaayyyyyy!!!!! Please enjoy a few photographs of my time in Ireland so far. Better pictures and stories to come, I promise. After seeing the map countless times, the coastline of France looked familiar. Breakfast at the hotel- much bigger than a French breakfast! Allow me just one ethnocentric moment... Are these outlets weird or what?! Social not-working? Works for me! I saw this hostel on the Internet, and then I saw it in real life. Had to take a pic. Some of that random art you find on college campuses. I am back in the world of lecture halls. The area just outside my apartment complex-- very green! They don't call it the Emerald Isle for nothing. Ruins of a building-- a house? Someone is trying very hard to keep it propped up. NUI Galway -- the Quadrangle. Another shot of the river with some lush, pretty farm land in the background.